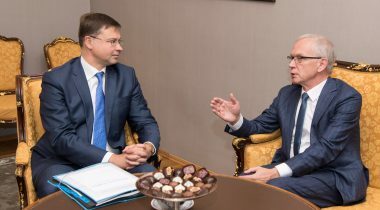 At the meeting of the President of the Riigikogu Eiki Nestor and Vice-President of the European Commission Valdis Dombrovskis, the discussion focused on the future of the Economic and Monetary Union and the budgetary policy of Europe. In Nestor’s opinion, all member states have to comply with the agreed-upon requirements to the budget, because only by having no exceptions it is possible to achieve the targets that have been set. 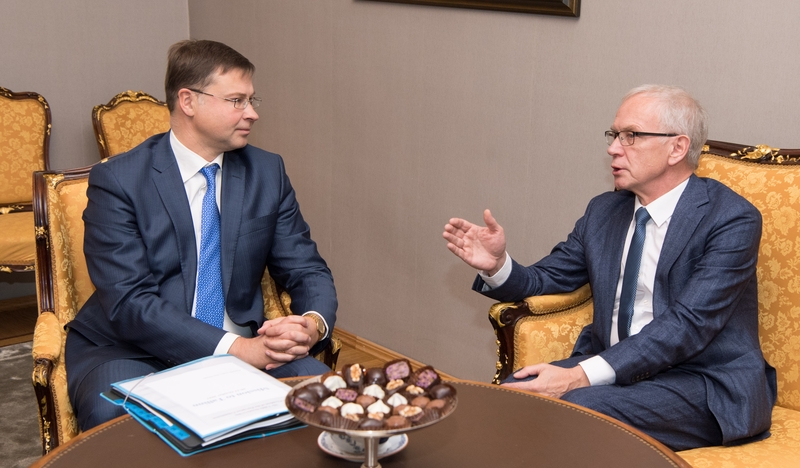 Dombrovskis acknowledged Estonia for having successfully restored its economic growth. He said that it was important to keep the budget discipline in good times, because in longer perspective it helped to preserve the stability of economy. In spring, the European Commission issued country-specific recommendations which set out economic policy guidance for individual member states. Estonia is recommended to pursue its fiscal policy in line with the requirements of the preventive arm of the Stability and Growth Pact, and adhere to its medium-term budgetary objective. Estonia has set itself the objective of not exceeding the structural budget deficit by more than 0.5% of GDP. The European Semester, structural reforms and the future of the Economic and Monetary Union of the EU were also spoken about at the meeting. Dombrovskis gave an overview of the options for strengthening the EMU. Vice-President of the European Commission Valdis Dombrovskis is one of the keynote speakers at the Interparliamentary Conference on Stability, Economic Coordination and Governance in the European Union (SECG), which is held at Tallinn Creative Hub today and tomorrow. The Conference was opened by Eiki Nestor. The conference is a public event and is streamed online on the parleu2017.ee web page, where you can also find its programme.